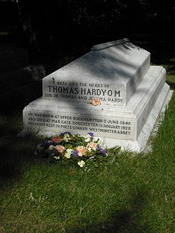 Far from the Madding Crowd, directed by Nicholas Renton, was a successful presentation of Thomas Hardy's novel. Through use of various film techniques Hardy's characters were allowed to come to life. The atmosphere and main themes in the novel are also successfully portrayed. The film effectively depicts the general atmosphere and the theme of romantic relationships of the novel. Establishing shots and long shots of the English countryside do justice to Hardy's descriptions and love for the landscape, through shots of long vast rolling hills, and small country towns. The role of the rustics is shown I feel more clearly then in the novel through this film. Scenes of the rustics at work help to establish the setting, era and the feel of the movie and also allow the viewer an insight into how people reacted at the time to courting and romance, through their reactions to Bathsheba's "affairs". The movie accurately captures all of Hardy's characters using a combination of casting, lighting, costume, music and camera techniques. Bathsheba's importance in the film is portrayed through use of Point of View shots and eye level shots to make the audience connect with her feelings. She is also often accompanied with the main musical theme in intense moments. Her costume reflects moments of personality through colour, and her change in power status through design. Gabriel Oak's natural, loving, constant character is shown through his connection with the country side. Dressed in colours of dark, earthy clothes he blends into the country side and is constantly shown surrounded by nature and sheep, to represent his softer side. WriteWork contributors. "Far from the Madding Crowd- movie reveiw" WriteWork.com. WriteWork.com, 12 November, 2004. Web. 20 Apr. 2019.